Chic and sophisticated, this Gigi New York bag is an everyday essential. So versatile, it can go anywhere and everywhere! Nothing but perfect and in love with my Gigi! Perfect and in-style for the fall season! Thank you RTR!!! This is a great bag. Lots of room and compartments. I like this bag! It is simple and classy, and the leather is super high quality. It's a very versatile bag. Compliments shopping, dining, can even double as a light briefcase. The bag's construction is very high in quality and nicely designed with several compartments to put things so that they can be found when needed. I like a bigger bag and this had a lot of room. It felt too much like a briefcase to me. I rented this bag through unlimited for a conference trip. It fit my 11 inch MacBook Air and wallet sunglasses comfortably but that's about how much you can fit in there. Very versatile bag. High quality bag that would be great for work or travel. It's big and has a briefcase quality. Bag is very beautifully made, and arrived brand new on my doorstep! I love it for work, and have received multiple complements about it. I would not recommend for anything informal, because it is quite big and bulky. Great bag - larger than expected! The bag was very nice, but it was a lot bigger than I expected! Definitely held a lot of stuff. Was great while I was traveling. High quality leather and overall a very functional handbag. The only downfall is the two straps in front, which make for a great look, but complicate the opening/closing process. Really high quality, nice looking bag. It's has a preppy, East Coast vibe - almost attorney briefcase (not in a bad way). Pretty roomy, but not big enough for a laptop (in case you're looking for something to use for work). Great, stylish purse. Perfect for fall! Great purse! Got it through unlimited and I really don't want to return it. It's just a tad larger than I expected, but for me that's a good thing. Overall just a well-made, good looking purse. It's a nice structured bag for use as a 'briefcase'. Tablet, keys, and other purse items def. fit inside. 4 out of 5 stars because the outside straps. Rented with unlimited, ended up sending it back right away. I rented this bag with unlimited and although there was nothing wrong with it, I sent it back before using it because of the size. 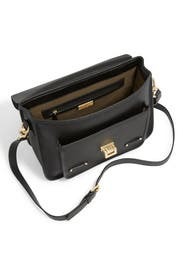 It was a lot larger than I expected and like other reviews said, it seemed like more of a mini briefcase than a purse. I think it would be great if I needed a bag for work or something but for everyday use it seemed way too large for me. Overall it was a really beautiful bag but not what I needed. I took this purse to London. It is pretty big, but I had room for 2 umbrellas, a bulky scarf, a digital camera and my wallet. There are 3 closures so you don't have to worry about pick-pockets and there's a pocket on the back side of the bag so you have easy access to your phone. Larger than expected. You can easily fit an ipad with all other purse things. I think it was more of a business look would be great for meeting, presentation. Beautiful bag but annoying to carry. I received this as part of my Unlimited membership and was really excited to take it to work and test it out. It looked brand new when I got it, tags were still on. It is a beautifully crafted bag, however, for me it just didn't work. It was heavy without anything else in it. Then when I tried to put everything in my current bag into this one, I couldn't fit it all (maybe not a knock against the bag, but how much I carry). Then the straw that broke the camel's back was the walk into work. I didn't tuck the straps into the loops and the closure ended up coming undone even though it was fastened. It was also a little annoying to carry. I was doubtful when I first got it. It seemed a bit to structured and I tend to go for softer slouchy leather bags. But I stand corrected. It is amazing. I just might have to buy it because I don't ever want to give it back!!! This handbag is amazing - the leather is top quality, it has plenty of room, and it is chic chic chic! I got so many compliments on it during a long trip to the west coast. Love! Lovely Leather. The straps on the front are a bit annoying to fasen each time opening/closing. Got this as part of my unlimited. The leather is very durable, strong, seemingly high quality. 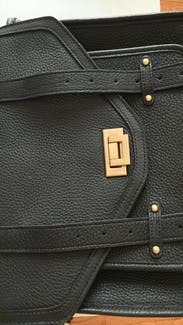 This isn't super soft leather, and the bag is very structured. It is a fun piece to wear to work and out an about on the town. I can fit quite a bit in it, except for a laptop. A nice purse for everyday - with a little rock n' roll edge. I really liked this purse - It didn't hold as much as some of my other bags, but then again, I really shouldn't carry everything I own in a purse. :) I got this as part of my "unlimited" rentals and was so happy it was one of the items they shipped to me. I also love that it is great to use as a crossbody bag, just for security purposes when you're walking at night. Really pretty bag. This purse is made extremely well with thick rich leather and perfect stitching around the seams. What I didn't like about it was that you had to remove the straps from the small loops on the front each time you opened the purse, and then place them back through the loops when closing it. If I just wanted to grab my phone or my card quickly I had to go through this annoying process with the straps. For me it didn't work with how often I want to quickly go in and out of my purse. This bag is the jam! Great work bag.. Roomy but not huge. Kept it awhile because I loved it so much. Good quality practical bag. It's a sophisticated version of an old school bag. It has a nice feel to it, almost like your favorite Voltaire saddle leather. The leather is soft but the bag is structured and firm. It stands independently like the photo shows. It is a true black color with a matt pebble texture. The inside is a dark green canvas material. It has one interior side zip pocket and two open pockets. Both open pockets are the same size and my iPhone fits in one nicely. It truly resembles an old fashioned school bag. I like it. This purse is made of very soft luxurious leather. It's very heavy for the size of the purse. It's stiff and structured. I'm not a huge fan of flaps but this one was okay since the clasp/buckle was easy to open and close. My favorite feather was probably the back and front outside pocket for easy access. It was a fun purse to carry around for a couple of weeks. Got this in my first Unlimited package and I wore it for a month! This seemed brand new when I opened the box, but that fresh new leather smell stayed for the entire time. Clasp works perfectly. 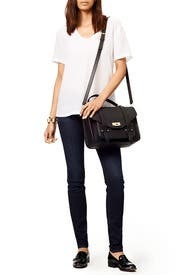 Great structure, easy to carry as a crossbody or over one shoulder. Looks great with a suit for work or with jeans and boots on the weekend. 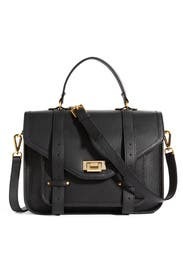 If I were in the market for a black every day bag, I'd buy this one. Great bag for everyday use. I got this satchel in one of my Unlimited orders and I've gotten so much use out of it. The leather is great quality and its not too heavy to carry. It easy fit my ipad, ipad mini or macbook air so it was ideal to use while traveling. What a great bag! Really fits so much and is so compact and pretty. It is on the heavier side. 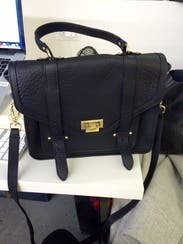 This bag is amazing- so amazing that I was sad to return it. The picture doesn't do the quality justice, it is very solidly constructed, pebbled black leather and looks great with anything. I will be certainly renting from this designer again. I have been carrying this bag to work and its perfect for that - not too big (wouldn't be able to fit a laptop inside) but the perfect size for a notebook, large wallet and some other things. Very nice bag. The leather is not quite as shiny as in the photo. Very hard structured bag. It can fit an ipad and books but not a laptop computer. The event was school so it was very useful to tote my laptop!! This bag made a great laptop case! This bag is perfect. It's a great size for daily wear! This bag has a pocket on the back which is great for easy access to phone or keys. The inside fits a whole lot (book, kindle, day planner, oversized wallet) and the structure is so nice everything stays in place! THE bag for everyday use and even for happy hour! I have always wanted a bag like this! There are many versions out there and this is definitely one of the best! I wish I could own it! I love the simple and modernistic look of this bag and gave every out a fun sophisticated look. It's a well made bag and maintains its structure day after day. Here's a list of some of the things I often carried inside: a 50 page school note book, pencil case, make-up case, small wallet, cell phone, keys, compact hair brush, water bottle. Sometimes I only carried my wallet, cell phone and keys and the bag still kept it's wonderful shape. Perfectly fit my small laptop. Everyone loved this bag, so chic yet work appropriate. The bag itself is very heavy. It double the weight of my laptop. Although this bag is beautiful, I was not able to use it due to it's weight. It's very heavy to carry around for extended periods of time. Got lots of compliments on this bag. Would definitely buy. Exchanged just to switch things up. Great as a handbag, good for the shoulder, but not crossbody.